While shopping at Trader Joe’s this morning, I was lured to the sample booth by a heavenly, enticing aroma…Pumpkin Spice Cream Cheese Spread, served on Cinnamon Swirl Bread. Ummm…YUMM!!!!! Both me and my 19 month old son gulped our samples down faster than you can imagine. God, it was good! But, after looking over the products that hey used to make it, this pumpkin cream cheese recipe would not have been very weight watchers friendly. So I headed home to make my own lighter version. And I was ultimately successful! Creamy and sweet and full of pumkin-y goodness, each serving is just a 2 Points. 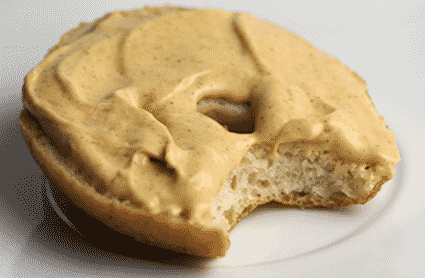 Serve some on top of a 1 Point Cinnamon Bagel for a FABULOUS WW snack idea! Though it’s not an official one of Weight Watchers Fall Recipes, this Cream Cheese Pumpkin Spread Recipe can be used in so many ways, I’m sure you will all just go crazy experimenting with it. Enjoy! In a large bowl, combine all ingredients and mix until smooth and creamy. Love it try it with Greek cream cheese. A tsp of lemon extract gives it a super yummy pumpkin cheesecake taste. Thanks for the recipe! Found it on Pinterest. Perfect!! Love it! I had the same thinking at trader joes :-) yum! Looks good. But I have to ask, why add salt? Besides the fact that salt in very small amounts is a flavor enhancer, complementing all the other ingredient flavors. Salt also makes the cream cheese “batter” a bit stronger and a little tighter. I followed the comments and I only used a half a teaspoon of Pumpkin Pie Spice and I wanted it a bit sweeter so I did 3 tblspoons of brown sugar instead of 2. SUPER YUMMY! I agree with a previous comment – too much pumpkin pie spice. It made it bitter. I had to almost double the brown sugar and add some more vanilla to get it to a point my family would eat it. I will definitely try it again though as it is definitely a wonderful fall treat! I found this recipe through Pinterest, and I had to give it a try. I am so happy I did. This and a bagel thin is my new go-to breakfast! I made this today. I only had regular cream cheese so I used that but next time I will use low calorie. SO good! Thanks for sharing! I just made this and it's delicious! this sounds great! just wondering if the points value you listed for the spread is the newest points plus value?? This is WONDERFUL on a granny smith apple!!!!! Ooooo…I LOVE this idea!!! Thanks for sharing! I was looking at the Bagels, and they are actually 3 points on weight watchers! Yeah, I think that's their new Points Plus value. Boo!! tried this as i am a pumpkin lover, pretty good, in my opinion a little less pumpkin spice, had a strong spice taste. but definitely worth a try. very VERY delicious! loves it! thanks LaaLoosh! i made this quick when my neighbors showed up and stayed for the football game. we ate it with ritz crackers and pretzels! very yummy and even the kids loved it! i will be sending this recipe to my other WW friends and family who are pumpkin lovers. thanks for posting this recipe. Have you tried it with splenda brown sugar? Do you think that would affect the point value at all? That sounds like a good (and tasty) idea! I don't think it would affect the Point value, but any way you can lower calories is great! Great recipe and thanks for the link to the Western Bagel. I am a new reader of your blog and didn't know about the bagel, pita, or english muffin. I have been looking for "fall" type recipes that would work with the Weight Watchers points. Thanks again for this pumpkin creme cheese recipe! !